The latest Crowl family member has arrived. Libby's waters broke at 32 weeks, but the doctors managed to maintain things for another ten days or so. His father is Nathan Baker, and his mother is our third daughter, Libby. They live in Auckland these days, so we won't be catching up with him for a few weeks yet. Sorry about the fuzzy photo - it was taken on a cellphone. 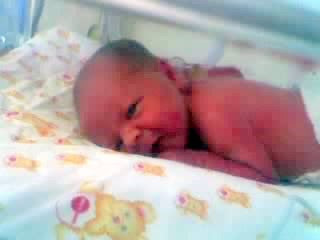 3.6.09 - it now turns out that the spelling of Leo's name should be: te Painga. This is the original spelling of the family name, so it's been corrected.